Located just 1 minute away from the Dallas Convention Center and the spectacular Omni Dallas Hotel, Eddie Deen's Ranch in Downtown Dallas is the ideal venue to create a True Texas Experience for convention and conference groups. With over 36,000 square feet of climate controlled event space it's the ultimate party place. 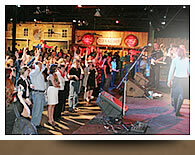 The Ranch is also perfect for fundraisers, rehearsal dinners, and corporate parties. Contact Us or fill out our Event Form for more details. There is a sense of certainty and consistency found only in fresh ingredients and cuisine designed for your unique taste. Each event has its complexities, meaning, and individuality. Eddie Deen's intent is to develop a personal relationship and protect the integrity and purpose of your signature occasion. By focusing on the benefits of catering, giving impeccable service and 28 years of executing upscale wedding rehearsals and receptions, complex convention and corporate functions, social events and business luncheons, your next party is sure to be a memorable one. 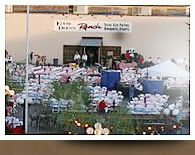 Eddie Deen offers four special event companies to assist in executing the perfect event in any setting. Featuring catering limited only by the imagination, Eddie Deen is committed to creating menus with your special event in mind and prepare them from scratch and perfect at a molecular level. Eddie Deen's Event Planners are focused on one thing, the intent & purpose that drives your event. Eddie Deen & Company Catering™ is a full service catering and event planning company that specializes in a variety of distinct menus prepared from scratch.